What is the best way to represent 3D in 2D? 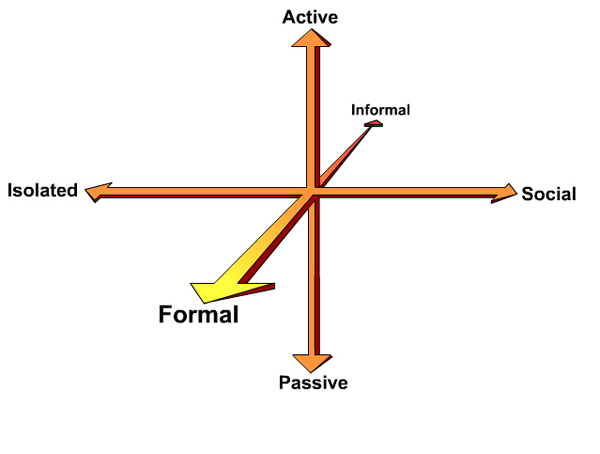 This was one of the difficulties expressed in feedback from the Stockholm workshop where the 'interpreting technologies in use' diagram was presented: an analytical matrix comprising x,y, and z axes and offering descriptors that span active to passive, isolated to social and formal to informal. 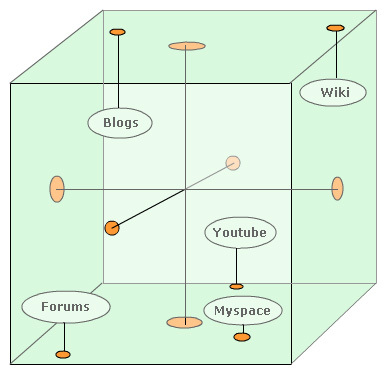 It is not a simple process to create a legible and visually attractive representation of a 3D matrix on a flat page. This is probably why in my original working of this diagram the formal to informal polarity was not included as an axes even though it is more than ever a vital part of how we interpret our use of technologies - as a brief aside I feel this dimension to be particularly relevant when we consider how emerging Web 2.0 technologies, that are in their wider internet usage largely informal, change in style and nature of their usage pattern when placed in more formal settings ... such as education ... a good example being the institutional deployment of blogging tools.